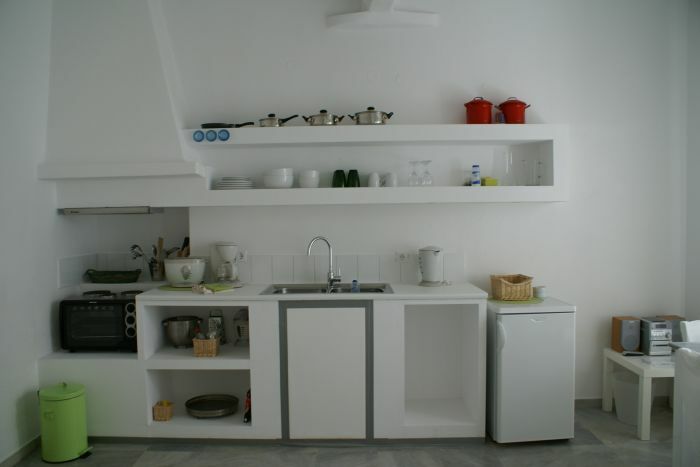 4 open-plan suites (studios), 2 one bedroom apartment suites. Top condition: very popular / limited availability. Location: Mykonos, Town (Hora) center, Fournakia area, close to Town Amphitheatre. Calm, secluded area, in attractive well kept garden setting. Distances: 4 km from airport, 1 km from old Town harbour & 3km from new port. Amenities: security entrance gate, own private apartment key, well-kept small garden surrounds entire property, perfect for relaxing and socializing. Pergola and outside areas all decorated with white furnishings and curtains. 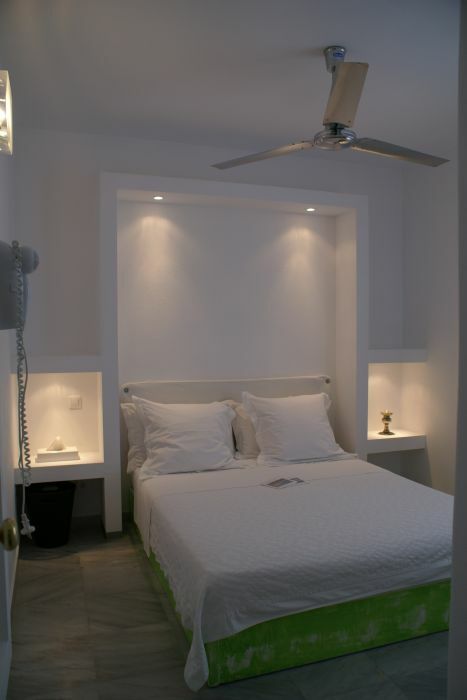 Facilities in all studio units: decorated white and pastel / design style, Greek marble paved floors; spacious & private with very well equipped open plan kitchen area, marble finitions, double bed or twin-beds “Mediastrom” mattress, choice of pillows, good size bathroom with walk-in marble shower. A/C, private safe, flat screen LCD TV (Greek channels), stereo HI-FI music system. Each suite is original, varies by special features or layout. Free WI-FI provided on property. + more photos of garden & courtyard. All units have balcony / patio-veranda or terrace space. 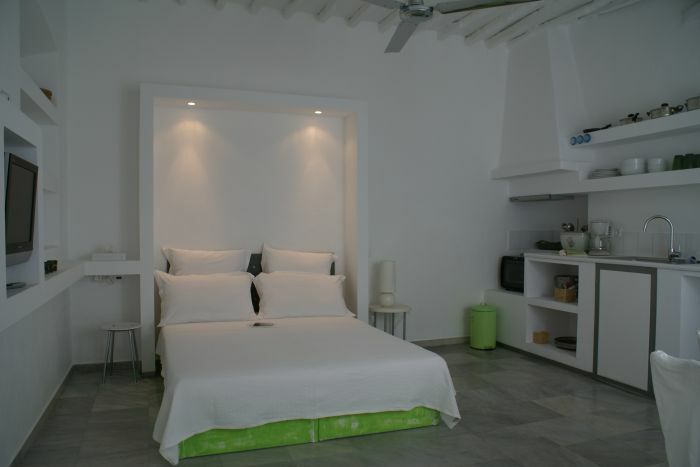 Facilities in all studio units: decorated white and pastel / design style, Greek marble paved floors; spacious & private with very well equipped open plan kitchen area, marble finitions, double bed or twin-beds “Mediastrom” mattress, choice of pillows, good size bathroom with walk-in marble shower. A/C, private safe, flat screen LCD TV (Greek channels), stereo HI-FI music system. Each suite is original, varies by special features or layout. Free WI-FI provided on property. Town Center: peaceful area, property is set in a small garden. 2 minutes walk away from main shopping streets, with boutiques, bars & restaurants. at enoplon Dynameon 10 ( upper floor), at the end of main street Matoyianni, in the heart of Mykonos town. whole Mykonos Town is pedestrian, and small you can cross by walking 15 minutes. M. A. C. can arrane a pick-up service from airport or harbour 3km away from Town.